Shown on BBC4. Watched by Chris Arnsby. 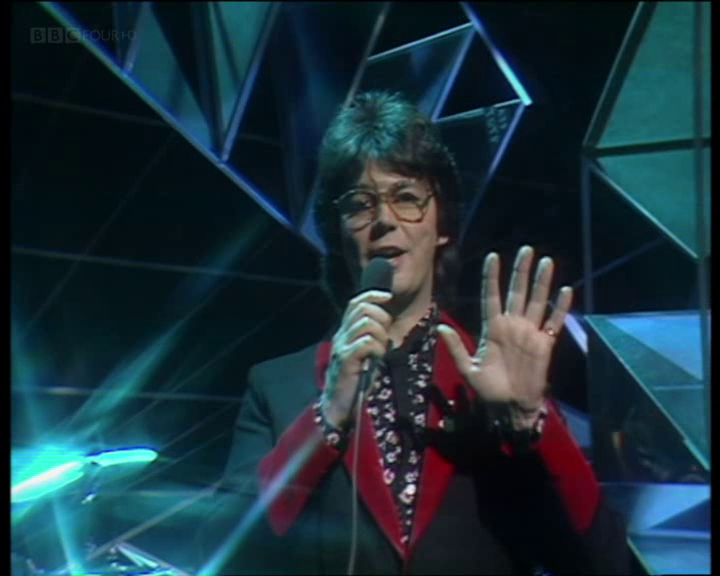 Mike Read: "Welcome to Top of the Pops. Some 19 million people every week tune in to see some of the top acts of 1981 on this show. Tonight, we're kicking off with Lynx and Intuition." Linx: Intuition . Intuition has done good business for Lynx. It's been featured three times on Top of the Pops -every other week- since the 12/03/1981 edition. Up to now the video has always been shown, some clever pop svengali has obviously decided that a studio appearance by the band will be a good way to squeeze out some more sales. It's a solid, competent, and professional performance. Unfortunately no one does anything amusing, the drum kit doesn't fall over, and the audience all behave themselves. Bah! Bucks Fizz: Making Your Mind Up . Also live in the studio are Bucks Fizz, just five days after their Eurovision win in Dublin. The band are now confident enough to skip the skirt ripping routine which got them a lot of attention in the pre-Eurovision build up. Presumably some comedy show at the time did a Bucks Fizz spoof in which the blokes' trousers were ripped off? If not then I've got a killer sketch idea to sell Little and Large for their next series. Watch out for Mike Read's disappearing act at the start of the song. After he introduces Bucks Fizz from the side of the stage he disappears from the edge of frame as the camera crane pans round, and he's gone by the time the crane shows a wide shot of the studio. Simon Bates: "Hello and welcome to this week's Top of the Pops with no less than nine new numbers. Kicking off with the first from Stiff Little Fingers, over here." Stiff Little Fingers: Just Fade Away . My one Pop Fact about Stiff Little Fingers was that they named the band after the physical characteristic of the aliens in The Invaders. Now www.snopes.com tells me that isn't true. In the absence of anything else let's talk about captions. They've received another upgrade over the last few months. The Stiff Little Fingers one that ends the performance is very fancy featuring an embossed 3-D effect with the words overlaid and trailing down the screen. Oh, and look out for the bloke dancing to the left of the stage. He is wearing a ludicrous gold top with what can only be described as peaked bat-wing shoulders. 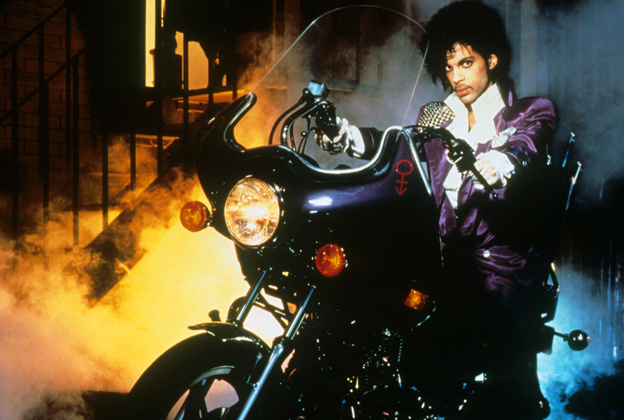 Prince was as big a star in the Eighties as Madonna or Michael Jackson and in terms of musical invention eclipsed them both. His signature style sounds simple enough; often the verse is almost identical to the chorus and the whole package is wrapped in a percussive cloak of handclaps and robotic beats. It is Prince himself who brings character with his expressive voice. His best songs are real earworms; once heard they are never forgotten. Being a true pop star he was also as eccentric as you like from his obsession with the colour purple to inventing text speak b4 we even knew we needed it! This is a film that takes the viewer on a journey into the sort of decisions you and I will never have to make but which someone does. In the present day an opportunity to annihilate terrorist suspects in a Kenyan village becomes a debate on the morality and implications of the act. 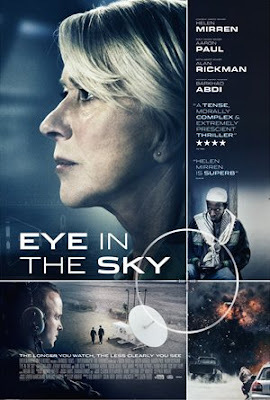 Several sets of characters are involved and we see the situation from each of their perspectives yet the movie also asks something of the audience. As the narrative progresses you inevitably start to reach your own conclusions and it is a shock to realise you are rooting for something to happen that will inevitably involve collateral damage. Though it’s a fiction, the film inevitably draws from arguments that have been going on in recent years and the result is a tense, gripping and unsettling story that it is soon clear will not have a happy ending whatever decision is made. Someone asked me this the other day and I realised I don’t actually have a favourite colour. When this person proceeded to list her favourite colours in order from 1 to 5 I marvelled at the ability to differentiate between the appeal of colours in such a way. 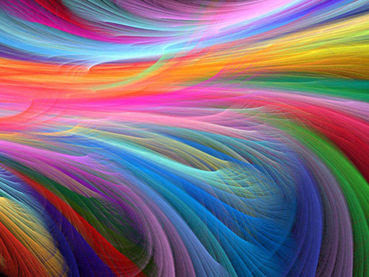 When we’re kids we are almost forced to have a favourite colour and if we don’t it feels like one of the first great social pressures in life to assign one. You can imagine the scenario. “No favourite colour?” thunders the teacher, “Well go and stand in the corner until you’ve thought of one” So it turns out that the corner is painted a sort of wishy washy pale eggy blue and in a heartbeat you declare “I have a favourite colour, Miss! It’s wishy washy pale eggy blue”. Huzzah. You have joined the human race. Two years playing the lead in Blake’s Seven ensured Gareth Thomas’ fame but obscured his more varied career across a range of genres. "I think of it both as a milestone and a millstone in my career" he once said about the role with which he is most associated. 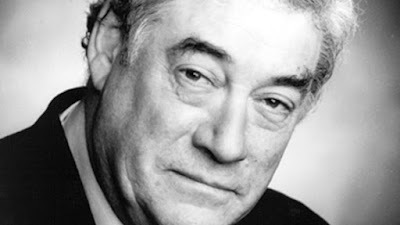 A RADA graduate, he was both an acclaimed stage actor including appearing in a number of Royal Shakespeare Company productions and was also nominated twice for a BAFTA. Amongst his theatre work he appeared in RSC productions of Twelfth Night, King Lear, As You Like It, Othello and Anna Christie. Other stage roles included HenryIV, Cat on a Hot Tin Roof, Equus and The Crucible. As recently as 2010 he received great reviews for his performance n Desire Under The Elms at the New Vic Theatre. 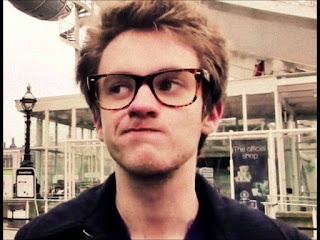 Peter Powell: "Hello! Welcome to yet another edition of Top of the Pops! And we've got a great show lined up! We've got The Who! We've got Roxy Music! We've got Duran Duran! And if you can handle that lot then hopefully you can handle this because live on Top of the Pops tonight it's Sharon Redd and Can You Handle It!" The song playing in the background is the first song of the show, that's become Top of the Pops standard operating procedure. Naturally it raises some eyebrows when the introduction to Can You Feel It is used to provide backing for Peter Powell. Has the BBC got them live in the studio? The Jacksons! (or John Lennon and His Four Ringos as Danny Baker memorably described them at this phase of their career) Surely Top of the Pops isn't going to break with all procedure and open with one of these newfangled pop video-thingies? No, as is revealed by the awkward transition into Sharon Redd's Can You Handle It?. Was someone playing a funnee joke based on the similarity of the two song titles? Has Michael Hurll changed yet another aspect of the programme? We may never know. Sharon Redd: Can You Handle It? . The Maggie Stredder Singers pick up a credit at the end of tonight's programme, presumably it's for their work on this song which sounds very different to the other versions available online. 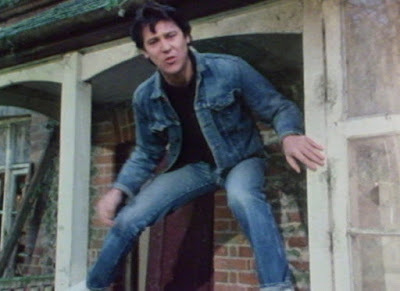 Shakin' Stevens: This Ole House  Shakin' Stevens has been allowed outside on 16mm film to make a promo so artless and obvious it must have been directed by Flick Colby. "Ain't got time to fix the shingles" [point at shingles], "ain't got time to fix the floor" [point at floor], "ain't got time to oil the hinges [point at door]". Etc. Less singin', more fixin', then your house won't let in rain, smoke, cold, fog, basilisks, and so on. Dave Stewart & Colin Blunstone: What Becomes Of The Broken Hearted? . A different Dave Stewart to the one you and Annie Lennox are thinking of. Superior sequel to The Maze Runner piles on the thrills. 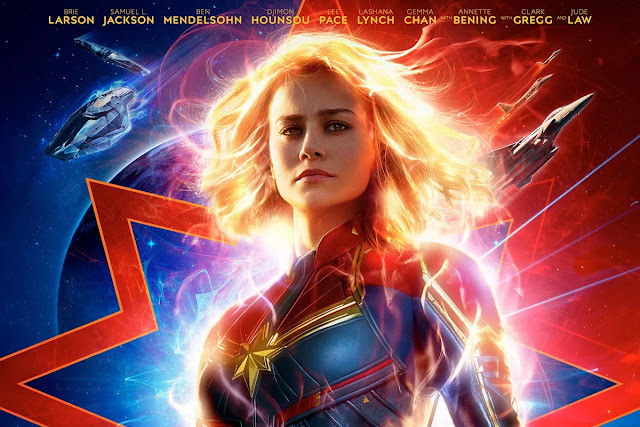 If I were actually the age at which this film is targeted it would probably be my favourite of last year. Even though I’m not I still think it’s a terrific movie which manages to tick all the boxes that a big action film should. Having recently seen a certain two superheroes battling it out I have to say this is a far superior film. 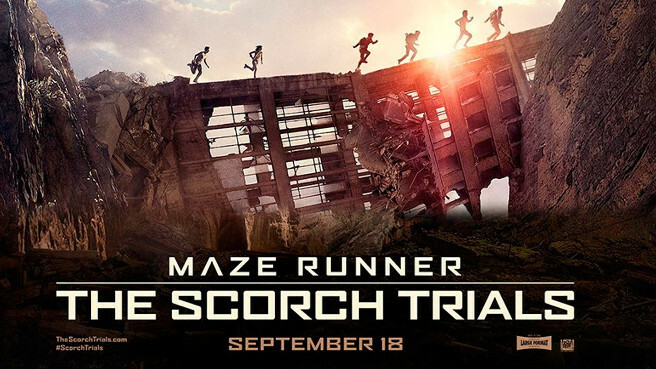 The Scorch Trials rarely stops to draw breath and its range of inventive perils is realised by director Wes Ball using balletic cameras and horror movie scares. Nowadays we struggle to comprehend how people existed without a smartphone but if you really, really think about it such a life is possible. But how did people cope without a fridge? It seems impossible especially during the summer but until the times when everyone got their hands on a fridge people did just that. It was surprisingly later than you might think even though commercial fridges were available by the First World War. Anyone who was well off enough to have a garage would just store milk and other fresh produce there but what if you didn’t have a garage? There was always the dreaded outside toilet but does anyone really fancy consuming something that’s been sitting in there for a day or two? Labels: Alternatives to fridges, Misc, Osokool, What is an Osokool? It's time to play: Who's On Strike At The BBC This Week? Tommy Vance has been CSO'd in front of a photograph of two lights, one red and one blue. Given the virtual nature of the set I'm going to guess the scenery crews were out. Tommy Vance: " Hi everybody. Good evening and welcome once again to Top of the Pops. Now Top of the Pops this week is a very, very special edition. I'll tell you why, well it's all wrapped up in one phrase because it's full of absolutely amazing music. I know you're going to love it and I think we ought to start with a real cracker. How about this one by The Teardrop Explodes. It's called Reward." The Teardrop Explodes: Reward . Normally when the same band appears two weeks in a row it's because BBC4 has skipped a repeat due to the presenter. This is not the case, this time. Unusually The Teardrop Explodes appear twice in two weeks. 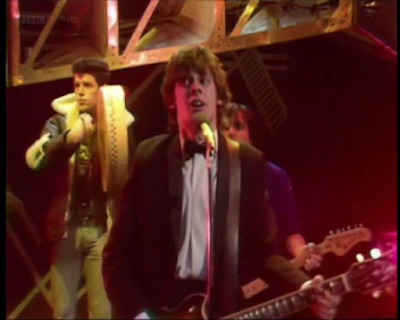 Last week they were on film racing around the Albert/Birkenhead docks (delete as applicable), this week their studio performance has been edited in from the 19/02/1981 Top of the Pops. Ironically this is the first BBC4 showing of this performance because D*v** L** Tr*v*s presented the earlier edition. Kim Wilde: Kids In America . Kim Wilde stalks down a corridor and looks startled as blinds snap open to reveal her band shining torches at her. It probably made more sense at the time, or maybe it was just a good excuse for the director to shove a hand-held camera in Kim Wilde's face; and why not? This video makes good use of the universal symbols of America; oil drums, graffiti, fences and blue flashing lights. It's like pages have been torn straight from Jung's book Man and his Symbols.